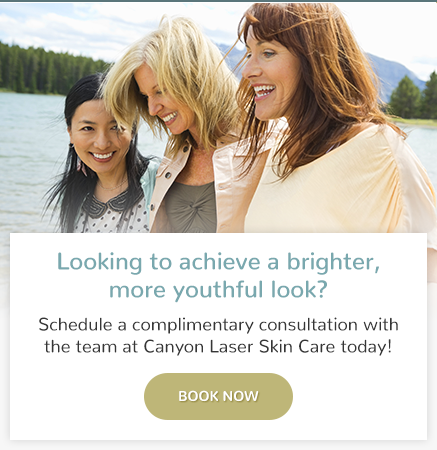 Dermaplaning is offered as an exfoliation procedure at Canyon Laser Skin Care in North Vancouver. Dermaplaning is a safe and highly effective physical exfoliation procedure. It requires the use of a sterile, surgical blade to gently exfoliate the skin's surface, removing the top-most layer of dead skin along with fine, vellus hair (aka peach fuzz). The procedure can be performed monthly, with no downtime post-treatment. Dermaplaning is only performed on the face; however, it is not meant to be used to shape eyebrows, which are made up of "terminal" (not vellus) hairs. The nose is also avoided. Physical exfoliation triggers the cell regeneration process and allows products to better penetrate the skin. A chemical peel post-dermaplaning can be applied to the skin for a deeper exfoliation and skin brightening. Dermaplaning is also excellent to rid the face of excess fine hairs which can often accumulate dirt and oil. Contrary to popular belief, vellus hairs, as opposed to terminal hair, will not grow back thicker or darker. Dermaplaning is especially effective on those with dry or rough skin texture and helps to minimize superficial acne scarring or uneven skin tone. It is also beneficial for mature skin, which tends to have a buildup of dead cells as cellular turnover slows down with age. Dermaplaning is safe for pregnant or lactating clients who cannot have chemical peels (peels penetrate the skin to act at the cellular level, thus are contraindicated). Those with very oily or active acne should avoid this procedure as well as anyone with thick, dark facial hair.